Every time I turn into the harbor parking lot I crane my neck for a view of the American flag. Old Glory waves on the post near the ramp. She makes me grateful and proud, but I also look at her for a more practical reason. She’s an indicator of what the seas will be like after I launch. When the stars and stripes fly at a 90-degree angle, the wind is honking above 20 knots. My crew and I carefully stow our gear ’cause we’re going to have a bumpy ride. When she luffs gently our seas will be flat. Once we pass the final channel markers in the No Wake Zone the throttle goes forward and we come up on plane (a flat or level surface). On those days the seas are like glass and we’re optimistic about catching ’em up. The flag wasn’t the first thing I noticed today, for amidst the sweet smell of drying seaweed and bladderwort I saw a launch line extended to the end of the parking lot. It was such a cluttered mess, and with so many trucks and trailers ahead of me, I doubted if I’d splash before the tide ran slack. I thought about heading home. Out here we all know the score. Fish don’t swim in the parking lot, so we make every effort to get under way. Experienced boaters help beginners, and that precision makes everyone happy. But something wasn’t right, and there it was; a crane was hauling an enormous sailboat. Both lanes of the ramp were occupied, essentially shutting it down. Fall represents the best time of the year to be on the water. If you’re a fisherman, the water temperatures are perfect. Cool nights follow warm days, and in the brine, pelagic fish move inshore. 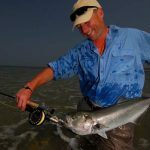 You’ll find bonito, false albacore, school tuna, skipjack and mahi-mahi in places where deep water adjoins shallow water. They’ll run along jetties and reefs, along edges of tidal seams and in channels. Cool temperatures at night fire up bluefish, striped bass and squeteague. These fish school up in preparation for their fall migration, and when they find a bait ball they turn the water white in a feeding frenzy. Fishing in the sweetwater is great, too. Lakes turn over when the surface is cooler than the temperature at depth. That churn puts trout, largemouth and smallmouth bass, walleye, and other fish on high alert. They eat to store extra calories before they spend the winter loafing in the depths, and if you pull your boat early you’ll miss some of the hottest fishing action of the year. If you can’t catch a fish in the fall, then you’d best take up another sport. Fall is a sailor’s delight. Windless days are few and far between. Trade winds that have blown consistently from the south are replaced by northerlies. Fall winds are consistent so let the spinnakers fly! Enjoy the rhythmic waves and the soft chop while looking at colorful leaves. The sun’s softer light is what makes the water’s surface look like diamonds. Out here in the port town we call home, we’ve named fall the 90% time of year. It’s when 90% of the seasonal businesses and restaurants are open and 90% of the traffic is gone. Save for the exception of charter boats running their final fishing trips, the ocean and lakes are wide-open to enjoy. Trailered boats roll down the highway without stop-and-go traffic. Filling up gas tanks and coolers is simple, and there is minimal competition on the water. A day on the water in the fall offers unparalleled relaxation. Sure, school is in session and my kids are busy with sports and activities. When there is a break in their activity, my wife and I make sure to get them, their friends, and our extended family on the water. Those half-day trips are a time for us to reconnect while doing something we all enjoy. In a few months the snow will fly, so we get in our last licks as often as we can. This fall, leave your boat in the water for just a little bit longer than you normally would. Even if you only get out for one trip I guarantee that final fall outing will be one to remember. And it’ll carry you through the off-season until it’s time to begin again. An award-winning writer and regular contributor to many sporting magazines and blogs. He lives on Cape Cod, Massachusetts where he boats, fishes and hunts with his family.